As you progress in your sport, you will receive instruction from many sources including your parents, coaches, other players, videos, and books. To learn a new skill (or correct one that is deficient), you need to understand the fundamental movements that comprise the skill and how these movements flow together in a coordinated sequence. You will need to initially think about the skill, break it down, and analyze your execution of it. You cannot think about how you will execute a skill during a game. If you do, you obstruct the subconscious body-mind connection that you've developed through hours of practice. This will slow reaction time and often destroy the natural flow needed to properly execute a skill. Likewise, observing yourself (as if you were a third person watching you) will also hurt your ability to perform well. Confidence and positive imagery is instead the key to success. You must know that the ball will go in, and see it doing so in your mind’s eye. See yourself executing each skill with perfect form—without thinking through every step. Live in the moment of these images—picture your success. 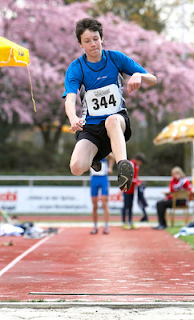 For example, broad or triple jumpers in track need to get their approach’s steps down properly to achieve the longest jump. The last step should ideally land immediately before the far edge of the takeoff board. By repeating successful approaches and takeoffs in practice, the mechanics of this skill are ingrained within a jumper. Thinking about how this is done during a track meet will only inhibit the body’s ability to do what it has been trained to do. Instead, a jumper needs to cast away any doubts about footwork and envision a perfect approach, takeoff, jump, and final result. When I played basketball in high school and college, I always approached the free throw line thinking that these “gimme” points were mine and envisioned the ball going through the hoop. Once I had begun the initial movement of my shooting motion, I would clear my mind, focus on the target, and let the hours of practice take over. 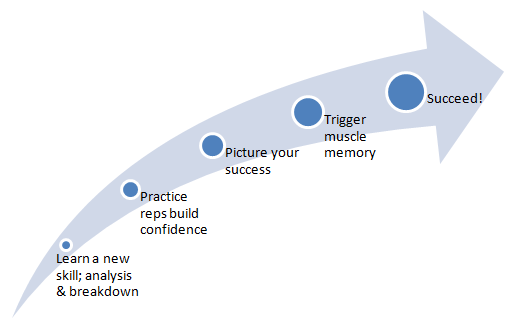 To let “muscle memory” take over, incorporate trigger movements at the beginning of the skill. In golf, this might be a simple “waggle” of the club’s head before beginning your back-swing. For a basketball free throw, you might bounce the basketball four times to engage your body and then exhale immediately before beginning the actual shooting motion. Whatever your routine, do it the same way every time. Practice your skills to the point that you don’t need to think about how you perform them. Trust your skills and play your game with confidence knowing that your body will follow your mind’s eye to the result you see and desire. Movements have to become instinctive, and that only happens with practice! If you have to think through every move/play you make you'll always be a little slower than the competition that is just acting. You are right Jodi - practice, perfect-practice as they say. Any old run through won't do it. But practice under 'pressure' is something a clever coach can devise. It won't quite be the "win States if you make this" kind of pressure, but something has to be riding on their performance. For soccer PKs - make it a shoot out. Winner take all. When it counts for the team, kids ignite. "Practice your skills to the point that you don’t need to think about how you perform them." Probably should elaborate on this in another article. No doubt that practice reps are necessary to develop fundamental skill mechanics. The next step is to understand what actually works in game situations. Practice at speed, against opposition, under pressure, and with muscles fatigued, all develop this aspect of skill execution. As Wendy points out, practice drills and games can be used to create these conditions. Pickup games (Playing Up/Playing Down) and live scrimmages also help a player develop an experiential understanding of his or her actual abilities. With solid mechanics and successful repetitions in game situations, confidence develops. A player than moves from thinking to imagery/reacting.